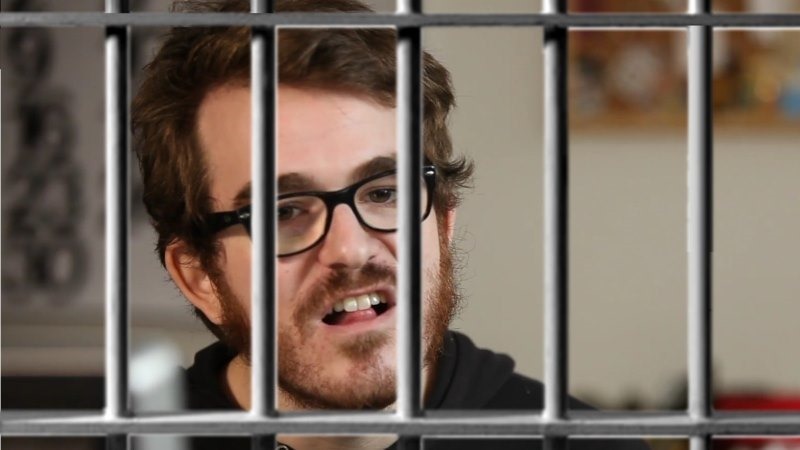 Is Phil Fish about to be arrested for racketeering? Phil Fish, the infamous developer of indie game Fez and for being a loud-mouthed critic of everything that doesn’t enrich himself, is rumoured to be under investigation by the FBI on charges of racketeering. The original story was posted on www.gamerheadlines.com and something weird has happened now. The direct URL for the article now redirects to the Google home page. No other mistyped URL does that which leads me into firmly planting my conspiracy hat on. Has the FBI forced DNS servers to reroute that URL and forced Google to empty the cache of the page? I unfortunately can’t find the entire article but the most important pieces were pasted on other sites. Take a look at this. There are three entities involved in the alleged crime, Phil Fish’s Polytron, the Indie Games Festival, and an organisation to give grants to developers called ‘Indie Cade’. The basic gist behind it is that Indie Cade originally gave Phil a large sum on money to jumpstart Fez. Indie Cade and Polytron then took seats as major judges in the 2011 and 2012 Indie Games Festival, boosting its chances to succeed and gain the publicity to make the title the major hit it became. Since Fez won best in show for both those years (the first time the game hadn’t even been completed), one can assume the plan was a success. It’s worth noting though that the investigation is still very much ongoing, and no formal charges have been made. Remember folks, innocent until proven guilty! Things certainly must be looking grim for poor Fish however, whom if found guilty will be facing a $25,000 fine and 20 year prison sentence for each count. Though the now defunct Polytron has been predictably silent on the claims, the Independent Games Festival did have a statement to make. Unfortunately that’s where it cuts out but the arrogance in that last sentence leaves a foul taste in my mouth. Anyway so back to the point at hand, remember this was all started from a video by ShortFatOtaku which has since been removed so we really don’t know how true any of this is. So basically the rumour is saying that the people behind IndieCade invested in Phil Fish and Fez, then pushed Fez through as the winner of Best in Show twice ensuring that the title would get a ton of coverage and likely great financial success. If that is true and the FBI is truly investigating this then we could realistically see Phil Fish behind bars for a year or two as racketeering isn’t something the Federal Government takes lightly. It would also instantly remove the rose-tinted glasses that the world is currently looking through when looking at some indie developers. Personally it all seems a little too far-fetched to be believable, and smacks of Gamergate conspiracy – but there is a lot in this world that shouldn’t be happening so you never know. There could have been a large conspiracy to enrich the lives of a few by manipulating the indie development scene. I think now that the big players in the market are taking indie more seriously it would be harder to pull this sort of stunt off. There is a massive write up with more details about this claim over on reddit which I’m going to repost here as the information seems to be getting taken down all over the place. You can scroll down straight to the comments if you don’t feel like reading it all; this is the end of the article. We have some interesting facts to disseminate for the public interest. In 2009 Philippe Poisson received investment money for Polytron Corporation in the form of a loan from several influential people. These 7 people later went on to form Indie Fund, the “funding source for independent developers” who were “looking to encourage the next wave of game developers.” You can consider FEZ to have received the “Beta” Indie Fund. Each of these individuals contributed a different amount of money to the FEZ creator and, in return, received a guarantee of a percentage of Gross Profits from Polytron. While this isn’t necessarily the de-facto standard method of investing in a company, it is a valid method of fund raising and isn’t suspicious in its own right. What is suspicious are the events that followed the initial investment of Polytron. In 2011, the Independent Games Festival (or IGF) had 5 members of Indie Fund on the finalists panel, and 3 members of Polytron’s staff. That’s 8 out of 10 judges. Mere days before IGF was to accept submissions, FEZ creator Philippe Poisson had to announce the delay of FEZ. Had Polytron finished FEZ on time, the game would have been a shoe-in to win the grand prize at IGF that year as they had a controlling interest. In 2012, FEZ gets through nominations and wins big. Of note here is the IGF anonymous nomination panel: all of the finalist judges are invited back to nominate games the following year. So the Indie Fund judges from 2011 would anonymously judge entrants for 2012. The nomination process is simple: a majority of people who vote on your game is all that is needed to push you through to the selection process. While judges are explicitly told that they can only vote on the games they are given, this is not the case, and any judge can vote on any game; for example, eight people who are members of a small clique can give one game a huge starting bias. In this instance FEZ would have started off with a bias of +8, and since it only takes a majority of people who voted to push a game through it would take at least 8 other judges to vote no, plus the number of judges that legitimately vote yes for FEZ. Even more interesting is that judges are not even required to play the game to submit a ruling on them. So, no time need be wasted by the submitting judges: they merely must say yes or no to continue the process. We know all of this thanks to leaked conversations of anonymous judges from past IGFs. We’d like to thank these judges for coming forward. Interestingly enough, and we think this is not a coincidence, the software used by IGF for the anonymous judges was created by Flashbang Studios – the same studio run by Matthew Wegner who had a financial interest in Polytron Corporation. FEZ was allowed through the IGF process twice – once in 2008 as a demo, which was strictly against IGF standards, and again in 2012 as a complete game – which created a fire-storm in the indie gaming community. FEZ was a pre-Indie Fund game. Antichamber was also an Indie Fund game, and it too was pushed through the IGF twice: once as Antichamber, and the year prior as Hazard. We do not suspect illegitimate practices on the part of the IGF; however, we do find it suspect that Brandon Boyer is close friends with Philippe Poisson, as he has stated on his twitter account multiple times, and is also friends with members of Indie Fund. We would encourage the IGF to investigate these possible abuses of the anonymous nomination process as well as have an outside third party firm audit the code of their anonymous jury nomination software. With that being said, I would now turn your attention to IndieCade, which labels itself as supporting the independent game development community. We intend to show that the only thing IndieCade supports is their own wallets. IndieCade works with “hundreds” of jurors to select a winner, where the Chair of the Awards Jury “works closely” with each juror to help them select the right game. We find it suspicious that the Chair of the Awards Jury works closely with the anonymous jurors (some of which may or may not be members of Indie Fund) and has a vested financial interest in one of the games submitted to IndieCade which, interestingly, won their grand prize. If this is true, then IndieCade is guilty of siphoning funds through ticket sales and sponsorship money as a prize for FEZ, which is then recycled directly back into the pockets of those investors. Philippe Poisson gets a payday from his buddy investors, and the investors, including Kellee Santiago, get a payday thanks to their loan agreement. Coincidentally, after its big awards win at IGF, FEZ was released less than a month later. This helped bolster the property and contribute to its hot sales. We question just how much of a hand Indie Fund had in procuring those IGF awards. We suspect that Indie Fund has manipulated events to guarantee that their “beta” product – FEZ – would be a success and give the investors at Indie Fund a good name, at the cost of damaging the entire reputation of the indie gaming community. This racketeering allowed FEZ to receive top marketing in the gaming media through its win at IndieCade, and helped line the wallets of its investors thanks to its win and Indie Fund’s suspicious involvement with IGF. If FEZ received such preferential treatment thanks to Indie Fund, what other games also received this treatment? Did Monaco, Antichamber, Dear Esther, and Framed, which are all Indie Fund games, also received special treatment because the investors at Indie Fund have their hands in the cookie jar? What other companies does Kellee Santiago have a vested financial interest in? What financial interests do these anonymous jurors for IGF and IndieCade have? Why aren’t any of these interests disclosed to the public, or even the developers that apply to these expensive events? Of the journalists that covered this, how many of them were “incentivized” by Indie Fund or their members to cover these games positively? We may never know the answer to these questions. We do know that these different festivals are extremely important to marketing departments, as Edmond McMillen stated on a podcast where he recounts a conversation he had with a Microsoft marketing director. Until we get full transparency of the judges and judging processes behind IGF and IndieCade we cannot trust their results. We would encourage these people who have any comments on this story to reach out to us at [email protected] if they wish to clarify, dispute, or affirm any statements made herein. For further analysis on this situation I would refer you to CameraLady’s Video, which you can find on Short Fat Otaku’s YouTube channel. Special thanks to: Camera Lady Peter No One Temet – an unfortunate victim to house slipper abuse RogueStar Anon Our anonymous leakers, developers, and judges and the 1971 Supreme Court case: New York Times Co. v United States.